After the Tommy Roe/Chris Montez tour the Beatles played individual concerts in England, riding high on their hit album, Please Please Me. This does not usually count as a separate tour, but there are collectable tour programmes from these dates. From April 4-27 1963 they played in Stowe, London, Buxton, Portsmouth, London again, Birkenhead, Middleton, Liverpool (the Cavern), Tenbury Wells, Luton, London (Royal Albert Hall), Stoke-on-Trent, Warrington, Wembley (NME Poll Winners Concert), London again, Southport, London again, Croydon, Shrewsbury, Northwich, Nelson, Sunderland, Chester and Norwich. April 8th John became a dad for the first time when his wife Cynthia gave birth to son John Charles Julian Lennon. John managed to visit the mother and child before the concert in Birkenhead April 10, and told that he was going on holiday to Barcelona with Brian Epstein. At the time Cynthia and Julian were living in the house of John's aunt Mimi. April 11. saw the release of the single From Me To You / Thank You Girl, and on April 13th they were on a TV show on the BBC, "the 625 Show", where they performed the two new songs, as well as "Please Please Me". This evening The Beatles met Cliff Richard for the first time at a private party in the home of The Shadows member Bruce Welsh. The day after they mimed to "From Me To You" for Thank Your Lucky Stars, and visited the Crawdaddy Club in the evening to see The Rolling Stones, all four Beatles arrived dressed in long suede jackets. April 16th they mimed their new single hit, this time for the Granada TV program "Scene at 6.30", while the BBC show "The 625 Show" was on simultaneously. After the concert in Royal Albert Hall on April 18th Paul was introduced to Jane Asher. It may be surprising that the Beatles played the NME Poll Winners concert April 21st 1963, as they had not won anything, but they were so well known for their discs now that they were invited to play. 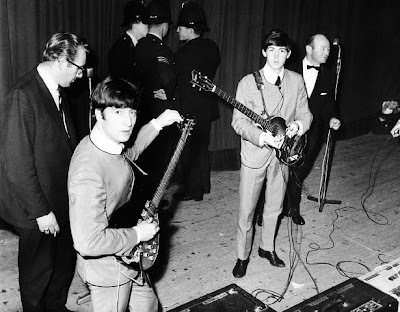 They performed "Please Please Me", "From Me To You", "Twist And Shout" and "Long Tall Sally" in front of an audience of 8-10 000, and the reporters believed that the Beatles stole the show from the more established award-winning artists Cliff Richard and The Shadows who went on stage after them to close the show. On April 28th it's finally a 12-day vacation for our heroes, John and Brian Epstein go to Barcelona, Spain while George, Paul and Ringo go to Klaus Voorman's family's summer house in Santa Cruz, Tenerife. After the holidays, the boys meet up again and continue to play individual concerts from May 9th until May 17th, only interrupted by a couple more TV recordings. 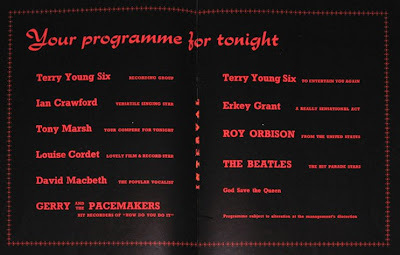 Also on this tour were Gerry and the Pacemakers, David Marsh, Louise Corder, Tony Marsh, Terry Young Six, Erkey Grant and Ian Crawford. Orbison had a great influence on contemporary artists as The Beatles and The Rolling Stones. The Beatles were fans of Roy, and as early as the very first radio program they participated in, Teenagers Turn, recorded on March 8 1962 with Pete Best on drums, the group performed the song "Dream Baby" with Paul on vocals. 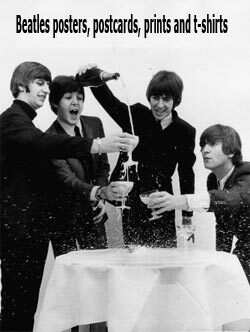 The song was a brand new single with Roy, released only a month before The Beatles did their version of it. In 1960 the song "Down The Line" (Orbison-Price) was part of The Beatles repertoire. 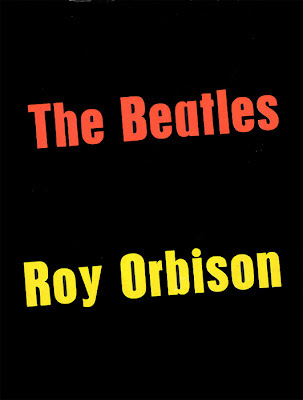 John Lennon mentioned Orbison as the source of inspiration for both "Please Please Me" and "(Just Like) Starting Over", and Roy was his all-time favorite singer. 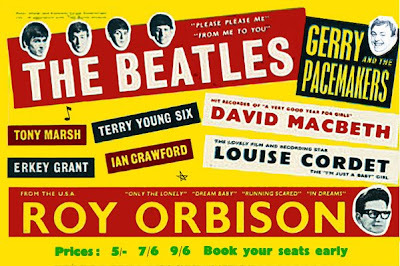 During the UK tour of 1963, Orbison encouraged The Beatles to come to the States. When they later were on their first U.S. tour in the summer of 1964 they tried to get Orbison as a support act again, but he had other engagements. In 1965 Orbison was touring as support to the Rolling Stones in Australia. He did it so well that the Rolling Stones tried to get him removed from the tour, because he was such a tough act to follow. Unlike many of the artists that came before the British invasion, Orbison continued to have hits. His single, "Oh, Pretty Woman" in 1964 marked the end of The Beatles' stranglehold on the Billboard Top 10, when it went to No. 1 both there and in the UK. 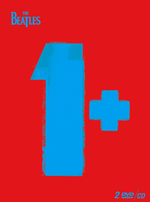 The album sold more copies in it's first ten days than any other single at this time, and eventually sold more than seven million copies. On the Roy Orbison tour The Beatles performed these songs: "Some Other Guy", "Do You Want To Know A Secret", "Love Me Do", "From Me To You", "Please Please Me", "I Saw Her Standing There" and "Twist And Shout ". On The Beatles tour in 1963, Roy was the main artist for a while, before the Beatles took over the closing spot. 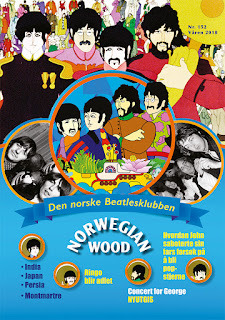 John Lennon later claimed that he had joked to Orbison that the Beatles were tiring of opening for him so Orbison agreed to switch, but the audience greeted Orbison with such enthusiasm that the Beatles became concerned that they would not get to perform, and called out to him from backstage, "Yankee, go home." 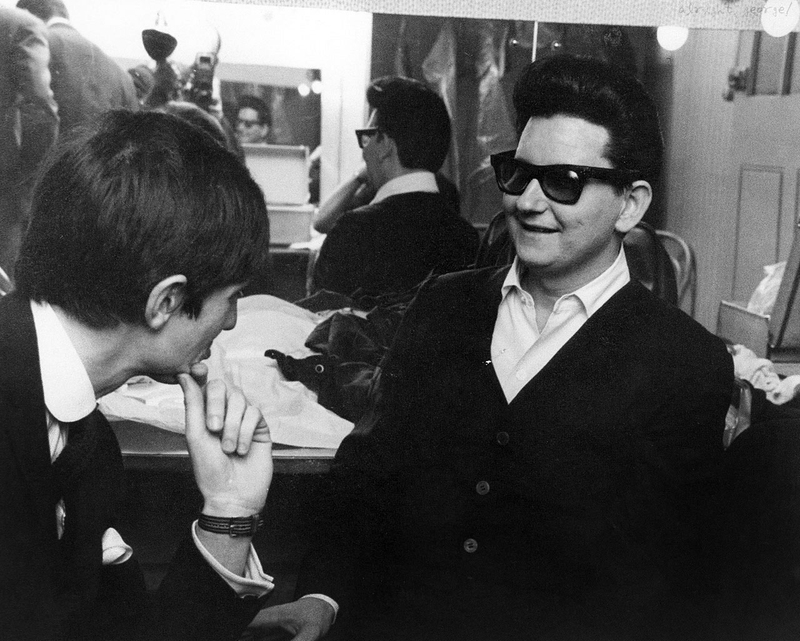 Roy Orbison had no sooner arrived than he was confronted by Brian Epstein and John Lennon. "Brian said, ‘Who should close the show?’, and John said, ‘You’re getting all the money, so why don’t we close it?’ I don’t know whether that was true or not, whether I was getting that much more than they were. I certainly wasn’t getting that much - and the tour had sold out in one afternoon." Roy later said that he was paid twice the amount The Beatles were getting, and he also recalled that he had mostly been singing ballads on that tour, while The Beatles played more up-tempo numbers. Leigh also attended the Liverpool Empire stop of the tour: "I remember the cries for the Beatles as Orbison stepped out on stage. I wondered how he could cope with it, but he simply whispered, "A candy-coloured clown they call the Sandman" and he was away. The audience loved him and forgot the Beatles for thirty minutes. Roy Orbison: "I remember Paul and John grabbing me by my arms and not letting me go back to take my curtain call. The audience was yelling, ‘We want Roy, we want Roy,’ and there I was, being held captive by the Beatles who were saying, ‘Yankee, go home.’ We had a great time." This was six weeks after The Beatles last appearance in Liverpool, and their visits to the hometown would soon become rarer and rarer as they had outgrown the city. 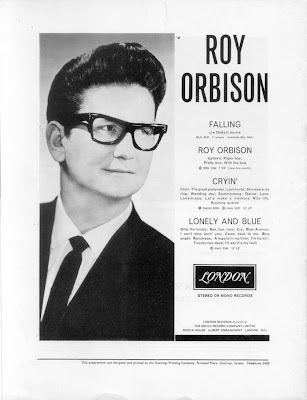 One of Roy Orbison's trade marks are the dark glasses, and this came to be during the tour with The Beatles. Roy was farsighted and needed glasses for this. He had two pairs, one with regular glass and a pair of prescription sunglasses. During a flight to Alabama he left the regular glasses on the plane and had to go on stage that night wearing his sunglasses instead. When he travelled to England to tour with the Beatles, he still hadn't gotten new regular glasses, and went on stage each night wearing the dark sunglasses. Photos from the tour ended up in newspapers and his management thought this was a great look, so from then on Orbison always appeared in public wearing his dark glasses. "I am sorry to say that Orbison completely overshadowed the Beatles. Orbison lacked charisma and was one of the few rock stars that you never wanted to be. He stood in the middle of the stage with his guitar and sang such songs such as Only the Lonely, Running Scared, Love Hurts and Crying. It was magical. The quality of his voice was truly amazing. So was his ability to convey raw emotion. At that time I had never experienced a broken love affair. Orbison obviously had and was able to communicate that to his audience. It was like reading a great book. I was taken into a world I knew nothing about." Actual memories from those concerts are hazy, unless the performance has the impact Roy's act seemed to have on our previous eyewitness. Here's word from a fan of the Beatles: I saw the Beatles on their first tour with Gerry and the Pacemakers and the great Roy Orbison. 'See' is the operative word as I didn't hear much for all the screaming! I remained a fan throughout their carreers. As I grew up, so did their music and that is what kept their fan base. 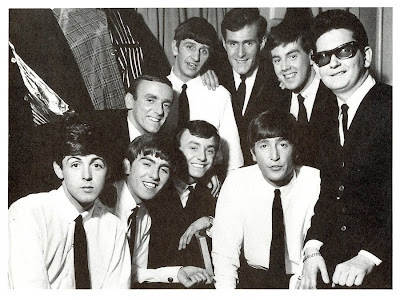 Here's another: I saw the Beatles live only once - in Blackburn as the main support to Roy Orbison! In those days, George was the only one with any real skill on his instrument. As we know, Blackburn was the last gig on the tour, and this audience member still remembers them as the support act. Strange. "There's story to this one, how we wrote it. We were on tour with Roy Orbison, and Gerry and the Pacemakers. And we were in Newcastle, up north of England, and we were in a hotel room. We had about three days left in which to write a song. We had a recording date set for three days from this date. So we went to the hotel and we booked in a room, and we just decided that we have to write a song very quickly. So we sat down, no ideas came for a bit. But eventually we got an idea. 'She Loves You' came, you know. It was just lucky." In 1988, Paul McCartney also recalled that the words to "All My Loving" were written on the bus during the Orbison tour. I haven't found any pictures of The Beatles as a band, playing on stage during the Roy Orbison tour, but this collage has been put toghether from individual portraits of them playing at the Town Hall in Birmingham on June the 4th. The photographer is unknown. The Beatles and Roy Orbison were to perform one more time on the same stage when both acts played at the 1966 NME Poll Winners' Concert. 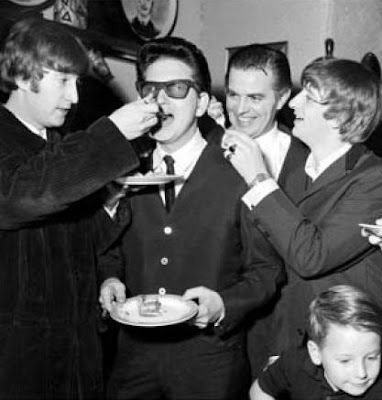 Orbison remained friends with The Beatles, especially George and John, and Roy was to join George Harrison's 80's group, The Traveling Wilburys. The Roy Orbison lookalike and soundalike, Barry Steele, and the Beatles cover band "The Complete Beatles" have been touring the UK with a "Roy Orbison and The Beatles: Live in Concert" show for a couple of years now. 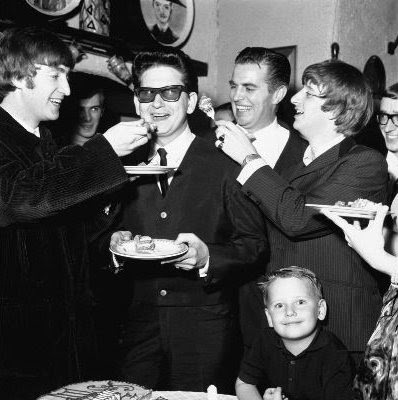 The photo of John and Ringo eating cake with RO is not from 1965. It's from 1964. 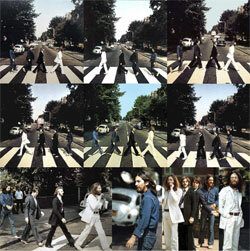 To verify this, see pictures of the Beatles in April 1964 (A Hard Day's Night) as compared with April 1965 (Help!) Pretty obvious.